Here’s our fantasy premier league teams GW15 article where we give our early thoughts on the FFGeek team for GW15. We look back at gameweek 14, The monitor list, transfer thoughts plus early captain thinking. So using my general metrics to judge a gameweek this would be another failure. A red arrow of 14k to 57k OR, a gameweek rank of 2.9 million vs a target of under 1 million. However the galling part was that I had 7 returning players vs a target of 4 which should be time for a celebration not a red arrow. However none got more than 7 points and my captain wasn’t one of them which tells the story regarding that aspect. Well I have a fairly template team (too much so some would say) so I’m immune to some extent to that although I’ll talk about how that’s breaking up later. However for the 2nd week in a row I’ve picked the lowest scoring captain of 3 options. That takes some doing and statistically I would have been better off letting the dog choose my captain for the last 2 weeks. My motley crew of differentials in Foster, Ings, Laporte and Fraser didn’t return en masse which again is some feat although Laporte was the only realistic chance with Ings injured and the others facing tricky fixtures. Obviously the reverse also works to improve rank. A template replacement player scoring more points than the template player, the right captain pick and successful differentials are also the general ways of going forward. 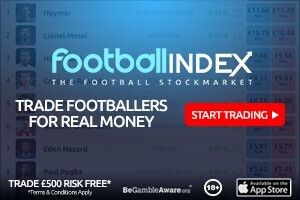 The template is going to change as the players within the current set up are being transferred out through form reasons and a changing fixture landscape. 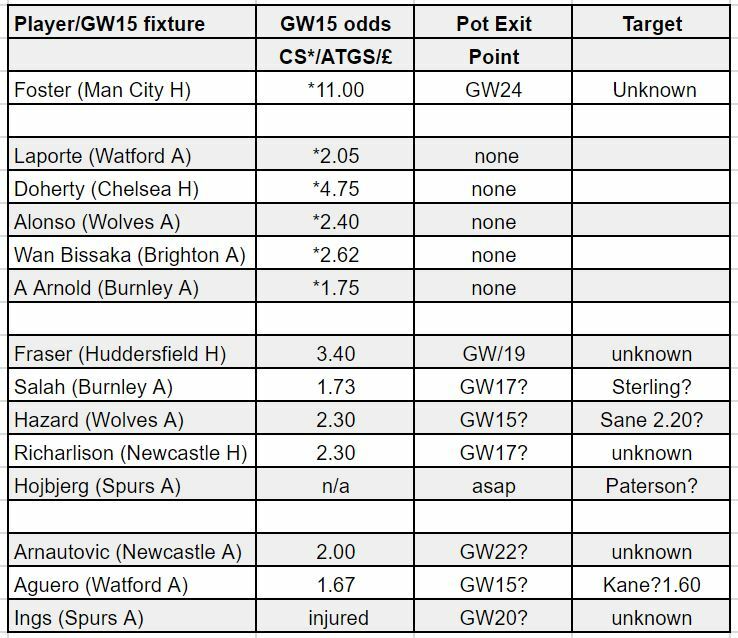 An Aguero no show and injury confusion for GW15 after not returning in a 4-0 win in GW13 is seeing him as a viable sale option for Kane. Kane is looking more like himself and has a good run of fixtures. Sane and Sterling are also looking like form alternatives to Hazard’s 2 assists in 6 gameweeks. Salah’s blank against Everton and early substitution also see him in the firing line. Arsenals fixtures after this weekend and Aubameyangs 16 point haul sees him as another player being eyed up by FPL managers. 1 free transfer £0.5m in the bank. So I’m ok with my defence although other things have put back any chance of changing Foster in the short term. The rest of the transfers revolve around the fixture swing to Spurs and the current form of Sterling and Sane and the possibility of selling Hazard and Salah for cheaper options as the template potentially breaks up. 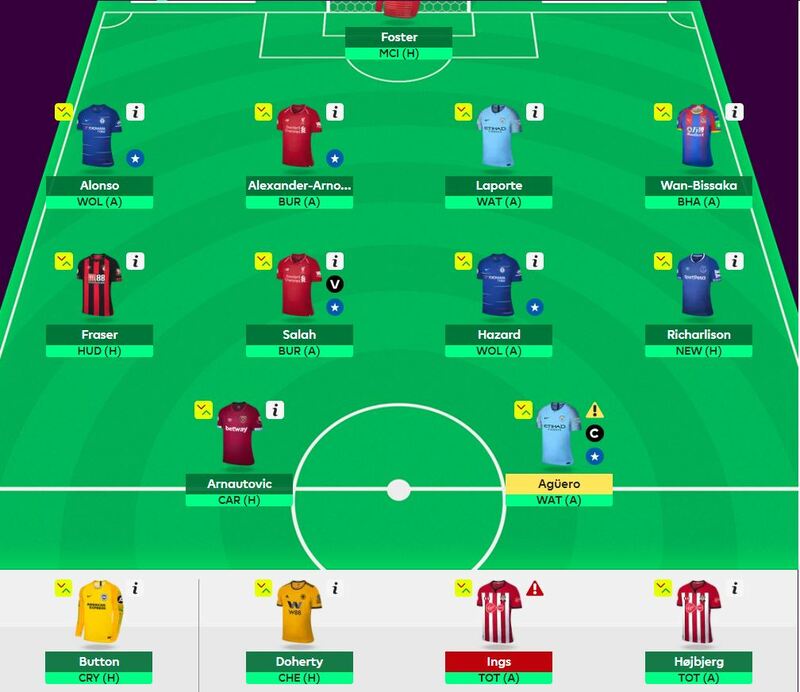 So my draft transfers are Aguero for Kane and Hazard for Sane which will be a minus 4. I haven’t ruled out David Silva who’s cheaper and has to be fairly certain to play given he was tested on Saturday. Although the fact that Man City play Chelsea in GW16 really means anything could happen selection wise by Pep. Aguero is mainly due to the fact that as he is a potential no show for GW15 given he was injured for GW14. There is, unhelpfully, conflicting information out there as to his fitness. Kane who has a good run of fixtures and is looking more like his old self is a decent replacement especially as he looks likely to lead the captain poll this week. Hazard is a chance to sell and use the money elsewhere while he’s been sold by other managers. I don’t think the situation despite the lack of returns is as dire as others seem to. His volumes and xG/xA have held up reasonably when he’s been on the pitch but he is expensive. I do have other ways of buying Kane without selling Hazard but not to get Sane. There’s no way to get Sterling in a -4 scenario without selling Salah which would be inadvisable given it’s Burnley next. Not an issue really, either Wan Bissaka at Brighton or Wolves home to Chelsea but it’s hard not to favour Palace in this choice. 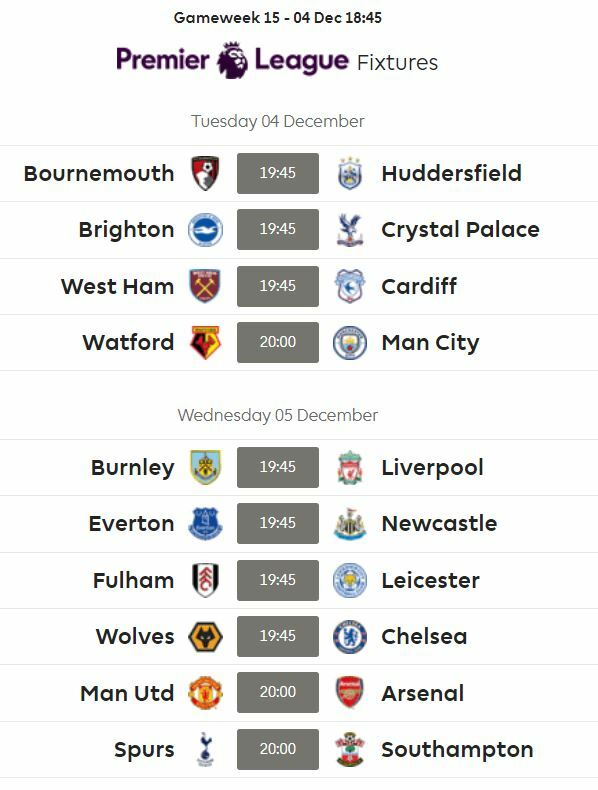 Gameweek 15 starts at 18.45 on Tuesday 4 December UK time. Set your team up now in case you’re waylaid for some reason. Hi buddy! In a fix really, shall I go for Kane and Gundogan or Vardy and Dilva? The Mane , Vardy and Aguero injury doubts have propelled me to take in Dilva and Kane…I suppose it pretty much resolves my dilemma…. First of all, I think you could have postponed your WC for one week as in these midweeks, you won’t have time enough to ponder and also take advantage of any price rises…. Imho, also I would take someone else over Zabaleta.. Nevertheless all the very best! Thank you for the feedback. Definitely agree that most people should WC next week. I had issues with bennet, aguero and lovren not playing. Zaba started all games recently and is cheaper than balbuena, also “cover” for the popular choice of fabianski. I am “differentialling” sterling with hazard, i guess. Also “the ming” has a good ring to it. I agree Geek that this week will see the templates ripped up. 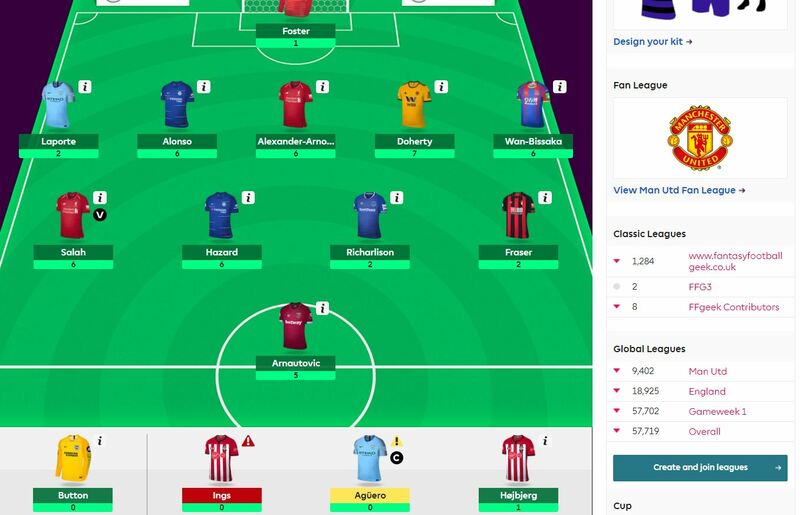 I had a score of 73 this week and now sit at an overall ranking of 1,733 – it’s early days but I keep getting captaincy decisions and transfer decisions right. Anderson has been amazing for me so far and I’ve taken a risk with losing Kun for Auba instead of Kane. The arsenal fixtures excite me more than Spurs. I’m also considering if Alonso is actually worth his price tag now but will hold fire for the next couple of game weeks before making a decision. Similar template team but with 1.mil in the back should I go sterling rather than sane? You had the 6 returning players, not 7. That probably made the difference between retaining your overall ranking or not. Interesting to see you finally planning to take a hit! Good luck. I’m in a bit of a pickle with Mane Aguerro and Ings all injury doubts and I was planning on getting rid of Barkley (pencilled in Firmino for Kane, Barkley for Kevin McDonald). Do you think the above is worth a hit? Anyone know the injury status of McDonald, he is currently marked red but has a return date of 5th Dec? I could get Billing instead of McDonald which would give me more security of avoiding a 0 in the short term but ties up 200k. Aguero to Kane and Mane to Sane make sense but I’m not sure you really need to take the hit doing Barkley to McDonald. If you are starting this week with 2.5m itb then you should still have 2m or 2.1m left which allows you to do Firmino to Auba next week. Maybe consider just lining out Wan Bissaka instead of Barkley this week in a 442 formation and avoid the 4 point hit for this week. Or just bring in Auba this week for the -4 as Firmino was very poor against Everton and may be dropped for Origi… sort out Barkley next week. I can’t afford afford to do the Aub transfer this week (along with Kane and Sane) as I am losing 200k each on Aguerro and Mane. Man U should be a tougher fixture than Burnley which was why I was keeping Firmino another week. Of course squad rotation might work in my favor and Barkley might play and with midweek fixtures there is more chance than normal of players being rested. I might keep Barkley and take the -4 next week unless I hear more news on team selection.